After viewing details, we wanted to get in touch with you & members directly regarding the unique opportunity to participate with the Target Smart Cars. We're excited to bring the exclusive branded ForTwo vehicles into Chicago this 4th of July! We'd love to extend members from Chicago MINI Club the chance to drive a Smart Car for in this single event date on America's Birthday. Ideal candidates possess an enthusiastic attitude to interact with the public and have small vehicle driving experience. Here is some information from Phil Wicks about his upcoming driving school on Saturday and Sunday July 23rd and 24th..
available to track day events. This has got to be the best performance mod to make your MINI drive faster and smoother!! I suspect this class will fill up fast, so get your registration in soon. Six cars from the Chicago area drove down together to Indianapolis where we met up with another six cars from the Minnesota Club. An additional 3 Chicago Club members caught us at lunch time and along the way. We ran an impressive 15 car high speed caravan down to the Cincinnati area. 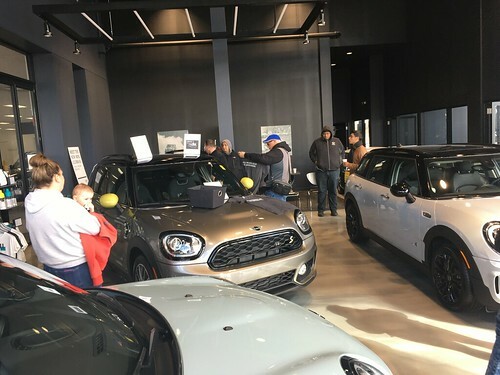 Over 100 MINIs converged on Kings Island Amusement Park in Mason Ohio on Saturday morning, June 16th. We were presented with VIP passes, and treated to a Continental breakfast in front of the Italian Job Roller coaster before the park oopened. We are able to line up to be the first ones on the ride when the park officially opened. A picnic style dinner was also provided as well as a chance to take one more exclusive ride on the Italian Job Coaster after the park closed at 11pm. All in all, a great weekend. I hope PKI puts together another event next year!! Here is the place to post for people interested in attending the Kings Island MINI event on Saturday June 18th. There is a group leaving the Chicago area at about 9:30 on Friday morning. We intend to meet members of the MINIsota Motoring Society at Dryer & Reinbold MINI in Indianapolis at about 1 pm for a late lunch. After eating, we will head on down the rest of the way as a larger group to the Kirkwood Inn in Mason Ohio. I am also aware of a few other people leaving the Chicago area later in the afternoon. The Windy City Morgan Owners Group has extended an invitation to our club to attend their Morgans Around Lake Michigan tour on July 7th thru July 10th. Enjoy a scenic drive, tour the Great Lakes Shipwreck Museum, and attend a British Car Club event near Kalamazoo Michigan.